Astronomers are using the Hubble Space Telescope to study the clouds of material along the paths of the Voyager 1 and Voyager 2 spacecraft through interstellar space. Astronomers using the Hubble Space Telescope have gotten their best looks yet at the mysterious interstellar clouds surrounding the solar system, a new study finds. These observations could shed light on the challenges that future interstellar missions dispatched to the nearest stars might face, the researchers said. NASA notes that Voyager 1 and 2 are currently zipping through space at roughly 38,000 mph (61,000 km/h). Voyager 1 is about 12.8 billion miles (20.6 billion kilometers) from Earth, making it the farthest human-made object ever built. In about 40,000 years, it will pass within 1.6 light-years of the star Gliese 445, in the constellation Camelopardalis, the agency says. 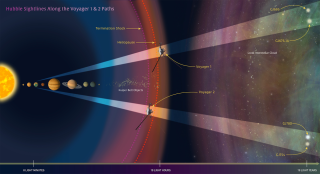 Voyager 2 hasn't entered interstellar space yet; it's about 10.5 billion miles (17 billion km) from Earth, NASA says. In 40,000 years, the probe will pass within 1.7 light-years of the star Ross 248, the agency says. The two Voyager spacecraft remain in contact with Earth through NASA's Deep Space Network of telecommunications links. The probes are still collecting data that scientists can analyze to learn more about the interstellar medium — the clouds of gas and dust that lie between the stars. The interstellar medium holds the building blocks of stars and planets, and is replenished when stars and planets die. In the future, the $100 million Breakthrough Starshot project, unveiled in 2016, aims to launch tiny spacecraft to the nearest star system to the sun, Alpha Centauri. It consists of three stars: Alpha Centauri A, Alpha Centauri B and a small red dwarf named Proxima Centauri. Recently, astronomers discovered that Proxima Centauri hosts a small, potentially habitable rocky planet, raising scientists' hopes that Starshot might be able to send probes to an alien world in our lifetimes. These new projects and discoveries make any data that the two Voyager spacecraft gather on the interstellar medium potentially key for exploration, the researchers said. "It's important for us to be aware of what kinds of objects are present beyond our solar system, since we are now beginning to think about potential interstellar space missions, such as Breakthrough Starshot," said study lead author Julia Zachary, an undergraduate astronomy student at Wesleyan University in Middletown, Connecticut. To learn more about the interstellar medium, Zachary and her colleagues examined data that NASA's Hubble Space Telescope collected regarding the same interstellar gas and dust that Voyager 1 and 2 are currently analyzing. In this artist's conception, NASA's Voyager 1 spacecraft has a bird's-eye view of the solar system. The circles represent the orbits of the major outer planets: Jupiter, Saturn, Uranus, and Neptune. "An analogy we like to use is that of Google Maps," Zachary told Space.com. "If the Voyager spacecraft are the Google Maps cars going around neighborhoods, taking pictures and giving you the street view, then Hubble provides the overview." Until 2015, Hubble had not gazed at any nearby stars lying along the paths of the Voyager spacecraft. The scientists used Hubble to analyze the light from these stars to learn more about the interstellar clouds the radiation passed through. The scientists discovered at least two interstellar clouds along Voyager 2's path, and one or two interstellar clouds along Voyager 1's path. They were also able to measure the density of electrons in the clouds along Voyager 2's path, and found that one had a greater electron density than the other. "We think the difference in electron density perhaps indicates a difference in composition of overall density of the clouds," Zachary said. In addition, the researchers successfully detected a broad range of elements in the interstellar medium, such as electrically charged ions of magnesium, iron, carbon and manganese. They also detected neutrally charged oxygen, nitrogen and hydrogen. All in all, "we think the Voyager spacecraft are moving into a very rich and complex interstellar environment," Zachary said. Zachary and her colleagues Seth Redfield, an associate professor in the Wesleyan University Department of Astronomy; and Jeffrey Linsky, a research professor in the University of Colorado Boulder Department of Astrophysical and Planetary Sciences, detailed their findings Jan. 6 at the 229th American Astronomical Society meeting in Grapevine, Texas.